Cultural exchange and improvement in communication between the Western and Japanese civilization have been the drive for the recent fascination Westerners show for the Japanese garden and architecture. For Japanese people gardening is equal to an art form. A growing number of Western architects and admirors of the Japanese culture decide to give their own environment and living space a Japanese theme. The result is we can find more and more influences of the Japanese culture in the West. Important elements we find in the Japanese garden are the characteristic fence and garden wall complemented with a matching Japanese gate. The Japanese gate is designed for multiple purposes. The gate is the obvious entry to the Japanese garden and attents the visitor that the garden on the other side of the wall or fence is based on the Japanese design and style. Wether the garden gate is open or closed the gate defines the essence of the Japanese garden and is the finishing touch. You will be amazed by the diversity of styles and designs Japanese garden gates are built in. You will also discover that some of the designs are hundreds of years of age and still are build today. Even modern, contemporary Japanese gardens feature traditional designed Japanese garden gates. The Hougei garden gates are fitted with traditional Japanese style ceramic roof tiles. However, we can also fit the roof with modern roof tiles or wooden shingles. Obviously Yokoso Japanese Gardens only uses certified materials of the highest quality. A Japanese garden is not really complete without a proper Japanese gate. Japanese garden gates come is a variety of designs, styles and sizes. It is very important you choose a garden gate that reflects the theme or style of the garden it gives access to. Yokoso Japanese Gardens selected 2 gates for you based on a traditional Japanese design. The Hougei garden gates come in two variations and sizes but can on request be customized to fit your needs. 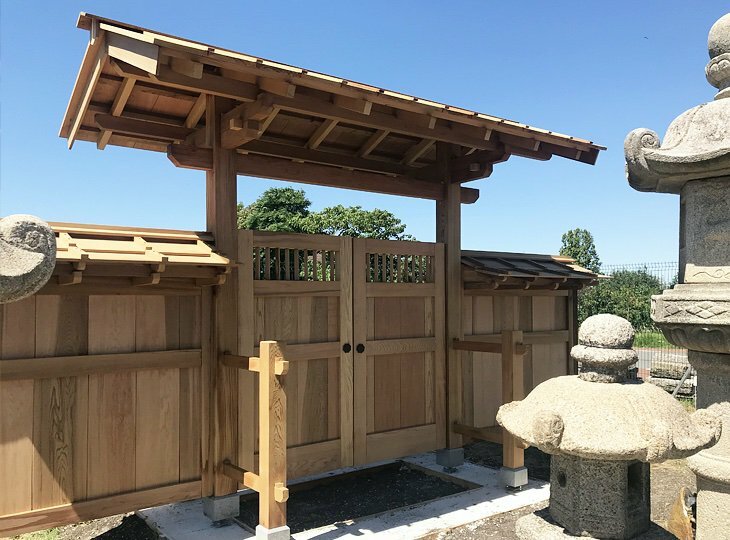 The Hougei gates are the finishing touch and the crown on your Japanese garden. Like any traditional Japanese architecture the Japanese garden gate is constructed mainly in wood. Wood is a very easy building material and the obvious choice to make strong beams, posts and framing from. The use of wood also has a few downsides like the need for regular maintenance and care. There is however no other material that captures the essence of Japanese architecture like wood does. Our wonderful custom built authentic Japanese garden gates are a feast to the eye and a dream to experience. Every bigger then middle sized Japanese garden can only be seen as complete when featuring one of these multifunctional structures. Imagine yourself, sitting in your own Japanese Tea House overlooking your beautifully landscaped Japanese garden enjoying a piece of authentic Japanese culture while the wind whispers gently through the leaves and the birds sing their poems. This Hougei Garden Gate, (Japanese for welcome), is the typical traditional Japanese gate to place at the most important entrance of your Japanese garden. On request the gate can also be fitted with doors. The roofing can be finished with ironwood shingles, traditional ceramic tiles or planks. The foundation of the garden gate should be determined depending on the location the gate will be installed. Research into and implementation of the foundation are not included in the base price of the Hougei. • The garden gate can be executed in Oregon pine or Western Red Cedar. • The roof can be fitted with ceramic tiles, shigles or planks. • The garden gate is available in 2 standard sizes. • Other adjustments and configurations and dimensions on request.